The cats version of David vs Goliath. Watch Baggy challenging Noey in a hilarious video. If there's one thing to be said about cats, it's that they are not afraid of anything. Take, for instance, Baggy, a pint-sized housecat who took it upon herself to challenge a lion, also known as the king of the jungle. A video uploaded to YouTube by Derek Krahn shows Baggy engaging in a stare-down with Noey, a lion, at The Centre for Animal Research and Education in Texas, US. 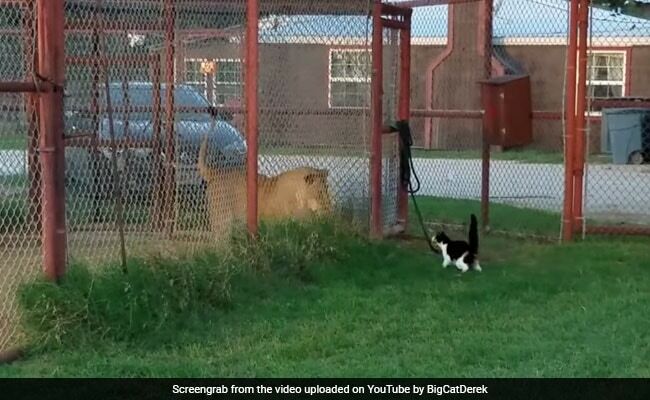 It's a classic David vs Goliath situation, except the two are separated by a wire fence, and they're cats. Minor differences. One can see, in the video, that Baggy challenges Noey fearlessly, never once faltering, even in the face of discouraging commentary from Derek. She continues on her quest of showing Noey who's the real boss kitty, even as Derek pleads with her to abort the mission. Watch the video below, and make sure you don't miss Derek's hilarious commentary. Since being shared online one day ago, the video has collected over 50,000 views, with many commending Baggy's bravery.